Great things can happen when we work together in friendly Feilding & District. That’s why in friendly Feilding we’re holding BA5's at least every month. Our relaxed environment makes them hugely popular for helping people to make valuable connections. Business cards, ideas and enthusiasm are exchanged and the host gets to showcase their business. The venue changes each month as the BA5 is hosted by a different local business each gathering. It’s a great opportunity for the host to introduce their business. BA5’s networking events often fill up fast, resulting in a waitlist. 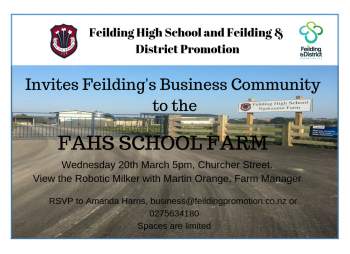 Feilding & District Business Promotions; we welcome you to join us.